Gay adolescents today are faced with a much more welcoming world than when I came out. Legislatively we have never had it so good and are now almost equal with heterosexuals. The big businesses who would once fire us now embrace the "pink pound" with relentless vigour. Even the unthinkable has happened -- the Conservative party has endorsed us. Far from being the "pretend families" of Thatcher's era, we can now marry and adopt children. On paper it really does look like gay people have made it -- but what are the hidden costs? "the gay rights movement has not just lost its teeth, it is operating like an elderly claret-soaked Tory making his way to the bedpan in the corner of the room: bloated, smug and plodding." 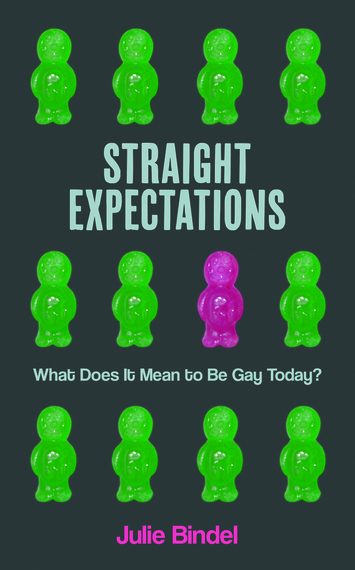 There's certainly nothing pedestrian about this book -- it's shamelessly ambitious, tackling all the hard hitting issues related to being gay today, from marriage, kids and bigotry to whether homosexuality is in the genes; Bindel steadfastly contends that sexuality is a choice and even maintains we're playing into bigots' hands when we say we were "born that way". But it's over gay marriage that she really takes no prisoners: she sees it as one of the last outposts of patriarchy -- an anachronistic institution which precipitates the oppression of women. Bindel is a proud "radical lesbian feminist" and understandably confronts the key debates from this standpoint: it is women who suffer the most from matrimony, she persuasively argues, but -- more controversially still -- she boldly claims that David Cameron's support of gay marriage is little more than a ploy to divert attention from the other, more vital issues, such as anti-gay bullying in schools, the organised prejudice of religion and the plight of lesbian and gay people abroad. Conscious that she seemed like a lone voice in objecting to gay marriage, Bindel polled 5,492 lesbians and gay men and 4,036 heterosexuals to reveal people's real attitudes to homosexuality; 88% of respondents supported equal marriage. She examines these responses at length, returning to them repeatedly throughout the book, resolutely going against popular opinion as she reasons that lesbians and gay men -- by jumping on the marriage bandwagon -- have opted for "ordinariness" rather than the more revolutionary concept of "alternative lifestyles." Bindel's rage at the current state of play burns through every page, but is juxtaposed with moments of surprising poignancy as she reflects on her own early days as part of a very different "community" -- that of the Gay Liberation Front, which is the point of comparison on which much of her argument rests. The GLF, we are reminded, was an organisation which didn't advocate for a seat at the table, but wanted to overturn that table -- not just for gay people, but for heterosexuals too. Society was intrinsically corrupt -- an avaricious, capitalist conspiracy resting on outmoded power dynamics. Nothing less than a complete overhaul was acceptable. "until gay men recognise that lesbians suffer the double bind of sexism and anti-lesbianism, and that the two operate together like a pernicious form of social control, we cannot effectively work together in a way that will benefit both groups equally." The text is peppered with quotes like this -- uncompromising and rabble-rousing, but convincingly argued. But neither do lesbians get off the hook -- crucially, it's the failure of both gay men and gay women, who have either become "too tired to fight any more or too conservative to want to dismantle the remaining oppressive structures", who really irk Bindel. These individuals are so desperate to be accepted that they're not just aping straight people, but -- worse still -- aping the most conservative of straight people - those who have sold out to a Faustian pact where "profit has trumped politics", in a gay commercial playground which values "equity over equality." We're living in a time when although people are unhappy with the status quo they are often afraid to speak out; causing offense is a definite no-no. Given this, it's refreshing to read a book that not only questions the state of the the gay nation -- the "new normal" -- but systematically rips into it. Bindel's irascible, impassioned, but always compelling voice reminds us what activism is about; change can only happen when you nail your colours to the mast. And that, Bindel concludes, is what the next generation of gay men and women must do -- will they "fit in or fight?" The future of the gay and lesbian movement now rests with them. Julie Bindel's Straight Expectations: What Does It Mean to Be Gay Today? is published by Guardian Books and is available to buy online.